the opening ceremony of the ICC Cricket World Cup in Jamaica. A billion Indian crowd cheered after the victory of India in Cricket World Cup 2011 Final. While the Indians were united, the people to people and media relations between the countries in South Asia depleted. Some people blamed India of fixing match and some were simply not happy with the results. The cricket is something which comes before religion in South Asia and anything which creates a misunderstanding may become a big reason for disturbed relations. 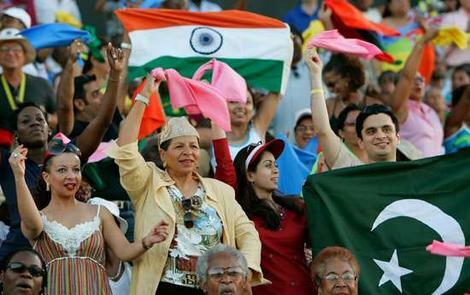 While the Indian media played a big role of disturbing this relations with their negative approach against Pakistan before, during and after the semi final match between India and Pakistan, there was another row which created before even a single run could be scored in the final match of the world cup between India and Sri Lanka. Sangakkara was blamed of cheating during toss, and Indians were blamed of fixing the match. Nobody knows the truth but these two incidences seemed to be merging. Many analyzers and think tanks gave their opinions on this issue and believe that Sangakkara’s cheating of toss may be due to the reason that match was already fixed, Sri Lanka was requested to bat first which wouldn’t have been possible earlier as he lost the coin toss first time. Till now there is no reaction or statement from Crowe and Shastri, who knows the best on what happened that day in the middle of the field. So why should we apply our brain and discuss something which is not even known properly to all of us. In a recent statement by Pakistani captain Shahid Afridi after just landing in Pakistan, he praised Indians of being so kind hearted and asked Pakistani media that why we hate Indians when we watch their movies, listen to their songs, and marry according to their customs. Today the same Shahid Afridi after watching the negative reports by Indian media is saying that Indians have very negative approach and they can not have larger hearts like Pakistanis. Shahid Afridi kept his point on why there was no need of bringing politics by Gautam Gambhir as he dedicated the world cup to the victims of Mumbai attack in 2008, we have our point to but then the same reason holds, let us not bring the politics. The government of India and Pakistan couldn’t arrive to the conclusion and solution working on it for past 2 years how can we come to a conclusion discussing it here. This is a blow to Indian media, and some Hindi news channels are really disturbing not only to them but also to the Indians. With everyday news on poison in mangoes, ghee, milk and news about some black magician or corrupted priest has corrupted the mind of the people. We are being shown news of what is happening in daily sops and sitcom instead of what is happening in the real world. It is good thing to create awareness that mango might have poison but you shouldn’t terrorize in such a way that people stop eating mangoes. It is such bad thing to watch people fighting in our website itself. Our English correspondent asked us if these three people [India, Pakistan and Sri Lanka] are fighting then why religion is coming in between. For us it was tough to answer but we answered that you live in such a simple state, variety is here, tough situations are here, but still we love and progress. We support the probe in finding whether the world cup is earned or bought. If Indians find that it is not earned , then the voice of the Indians will be even more stronger against the culprits that other countries can not imagine, but till then let us praise the wonderful game shown by Yuvraj Singh, Zaheer Khan, Gautam Gambhir and MS Dhoni who played the much needed knock when he was not in the form. And pray that the authenticity and originality of cricket remain unchanged and let us keep the cricket clean.